I am watching my Mum slowly succumb to her dementia daily, but it feels like I am seeing it from the inside. I don’t know how to describe this so you can understand. I am invisible in a room full of people, Gill has dementia so do we include her or not? Am I the only one who is experiencing this feeling of when this is my turn, because you may not get dementia. My Mother’s name was Iris, and like the flower she was a very complex person. It was Sunday 14th June, our family had somehow managed not to avoid each other and all visited my mother together. So, my Dad, my Brother and Sister-in-law, Sister and Brother-in-law, nieces and my daughter were in my Mothers room at the nursing home. The rift in the family growing wider and wider with my sister and her family on one side fighting some bizarre war in her head with us all, and everyone else at ease with each other on the other side. My Dad torn in two in the middle My Mum lying between us, her breathing ragged but looking peaceful as she is in her final hours. She does not seem aware that anyone is with her, but I believe she can hear us all and knows that for the first time in years we are all in the same room together. We spent the day chatting about our memories, listening to some music, and talking generally amongst ourselves. My mother may not have appeared conscious enough to join in, but it felt like it was normal family get together with people chatting and laughing and I am sure she was with us. We had the call later that evening to say she had passed peacefully away at 10.34 pm. I believe she had waited until we were all together. I cherish having visited her every day the weeks at the end. My daughter and I played her favourite hymns on her iPhone and watched her tears. We played her favourite music and sang along (out of tune but no matter it was fun). She was no longer able to swallow, so she had no food for weeks, and finally she could no longer have liquids. Every day the nurse and doctor would say “it won’t be long now, she may pass tonight”, and the next day there she would be defiantly showing she was not ready to go. Fourteen days she continued without any liquid, and everyone was amazed by her stubbornness, and strength of character to fight to stay with us. One of the nurses sat down with me and explained how they knew she was not in any pain, at the end I don’t think she was, before I am still not sure. Her death was natural without any pain relief so I am sure she was aware of her last day with us all. Yes, I can now see that perhaps it is easier for us to want her to be given pain relief just in case, but then it could have changed her perception of her final hours. So have I been wrong? No; my view now is that a small amount of morphine ‘as and when’ may have been better when the sores were painful. But, then at the end when she had no pain = nothing. The carers thought she was lucky they said, most people never have visitors. I am glad I had time to make my peace with my Mum, I am glad I had time to sit with her, talk to her and be back in my family. I am glad I witnessed the end of her dementia, it has left me feeling comforted with my own dementia. A new chapter with my family now begins. I need to visit my Dad on a more frequent basis to support him, and do my part in taking care of him to stop my sister from mentally ‘abusing’ him. This scares me because staying strong and being capable takes more effort than I think people realise. Still, it’s what we do isn’t it? I am sharing my thoughts about being with my mother who has had Vascular Dementia for a while and is in the final stages of life, but at the end of her 80’s she has had a reasonably long life. Some of what I am writing may upset some people, just saying so that you can choose not to read on if you wish. Yesterday, the family sat around my mother’s bedside in the nursing home. Each day we are waking up to wait for the phone call to say she may have peacefully passed away but she is defying everyone by staying with us. This is the third day without any food or drink, however she is not in any pain and looks so peaceful. Yesterday morning she opened her eyes and looked at my Dad. “Hello my lovely”, he said. “What have you got to say to me today? He is stroking her head and face. “Is there anything you want to tell me today?” he asks? “I expect you want to tell me you love me. I know you can’t talk so just blink if you want to say you love me” he says gently. My mother blinks, he tells her he loves her. I quietly cry to see such a touching scene between them. After a while, my Dad falls asleep in the chair next to her, at 93 he finds it hard to stay awake for long periods without ‘naps’. My sister reads her book and I start to read mine, music is playing low in the background; Doris Day, Harry Secombe, Vera Lynn. It seems like the first time we have just sat there in silence with her. My brother and sister-in-law will join us in a while. I watch my mother breathing shallowly, the pulse on the side of her neck beating steadily. I think about my awful childhood and she was so nice to outsiders but so abusive to myself. It seems a million years ago and in a very distant part of my life now thankfully. I made my peace with my Mum when I was able to visit her alone a few weeks together which was needed for both of us I think. I look at her now and know that at some point my dementia will mean that I shall no longer be able to communicate, or understand what is happening around me. It makes me feel sad when I am sitting with my family and having these thoughts alone, but then it is not appropriate at all for me to talk to them about how I am feeling. When I hear the carers and nurses talking about ‘how it is for people with dementia’ I want to tell them not to talk like that. I want to say, people with dementia are not THEY, they are me, maybe you at some point. Of course these feelings are ridiculous because nobody can identify with the person lying in the bed at the end of their life with dementia, can they? My Dad is reluctant to let my Mum go at the same time as dreading it. We are sitting around her bed and I know that we are willing her to pass peacefully away with us there, and not torment us in the waiting to start grieving. Does that sound terrible? A fierce woman, a strong woman, a woman with a will of iron, never afraid to say what she thought. Never wanted to be overlooked. The home she is in, is full of lovely caring nurses and carers, most of whom are Eastern European. They treat my Mum with such love not just kindness. They tell her they love her, and she has recognised and appreciated that. My daughter will be the person who will be making sure that I am cared for the same, and I hope that she is diligent in her monitoring of how I am. Not that I don’t think she will be, but I hope she isn’t too busy to do so. I have been functioning fine, I have been cleaning, cooking, washing, ironing and taking care of my Dad, but when it comes to organising and making decisions I struggle and leave that to my brother. I am no longer able to cope with the stress of family difficulties between each other like I used to. My sister treats me if my dementia is worse, my brother treats me as if I am fine (which is better I guess), and my Dad is probably the only one who understands how I am now and does not expect too much from me. My daughter thankfully, continues to check on me daily to make sure I am fine as she understands how it all affects me. But all this is not about me, this time is for family and my Mother. I just happening to be having my own difficult time of it with a broken marriage, moving to a new area, and coming to terms with my Mother dying. Thank you my friends for listening to me. 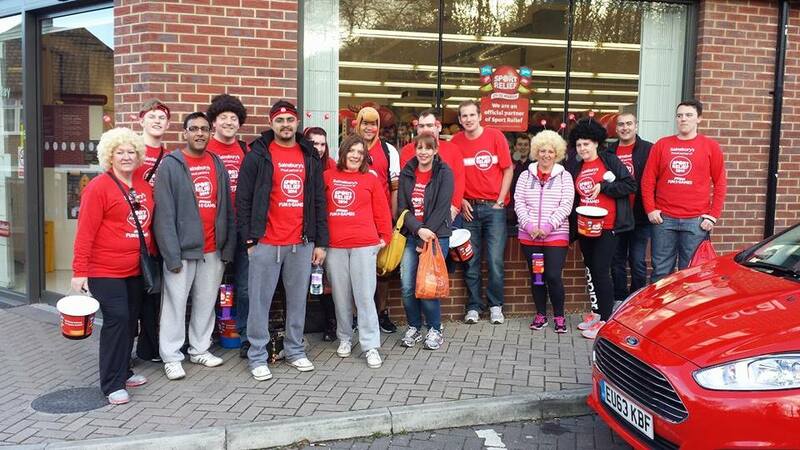 A couple of days ago my daughter phoned me from London and told me she would be walking with some of her work colleague’s at Sainsburys Supermarket for Sport Relief http://www.sportrelief.com/. She had recently expressed her dismay at the way some people are taking a “selfie without make-up” for breast cancer, saying what good will that do without donations to go with them. She decided that she wanted to do ‘something’ rather than just give a simple donation and joined in the 12 mile walk to raise donations. Now this is a person who has clinically flat feet, and who lately has complained of intense pain in her feet through wearing rubbish shoes as she tells it. Working only 20 hours per week she does not have extra cash to buy good shoes for her feet, but here she is walking to raise money for others. She got up at 5am to get ready for work at 6am, worked until 9am and then joined the walking team to start at 10am. Their aim was to walk carrying buckets, to each main supermarket store collecting donations on the way. After 8 miles the area manager surprised them all by joining them for the remainder of the way, and as she put it he could have sent an email to wish them well, but chose to walk instead. She text me a couple of times with her progress saying her feet hurt but was enjoying it. After taking a detour they finished the walk having completed 16 miles, in a pub for a drink paid for by the area manager. When she was home she phoned me sounding exhausted, it was brilliant, she said, we were all buzzing, we must have collected about £200 plus our own sponsorship donations. I hurt all over, I have enormous blisters, but I want to do it again, she told me. I want to start doing things for charity, I want to run the marathon, it feels so good although I know that sound selfish! There is nothing wrong in feeling good helping others. She needed to eat, bathe and sleep next. A hot bath would have been good but the landlady had the taps removed to save money leaving only a shower, it would have to do I told her. There is a matching one on the other foot – ouch! Right now I am the proudest mother ever not just because of her achievement but her wish to help others. Author GillPosted on 22 March, 2014 22 March, 2014 Format AsideCategories Family, My Alzheimer's JournalTags Alzheimer's journal, Children, Daughters, family, honesty, Love, My Alzheimer's Journal, thoughtsLeave a comment on A proud Mum!